As I write in mid March it is galaxy season. The days are getting longer but now, just before the dreaded daylight savings time, full astronomical twilight still occurs by eight o’clock. The Milky Way is halfway down in the western sky and will set by midnight. To stay out of the wind, I set up in the driveway to the east of my home in Torrey. The Big Dipper is standing on its tail to the northwest, Leo is prominent in the eastern sky and Bootes and Virgo are rising. Summer is knocking already and Arcturus is just clearing the horizon. Above Arcturus is the constellation Coma Berenices (the beautiful hair of Queen Berenice of Egypt — astronomy is relentlessly poetic) where the north galactic pole is located. The north galactic pole is different from the North Star which marks the Earth’s north pole, this is the north pole of the galaxy. The Milky way is a spiral galaxy that rotates in the heavens in a flat, plate like way. When we look into the glowing band of the Milky Way at night we are looking out through the flat part of the plate. When we look at the north galactic pole we are looking straight up from the plate and straight out of the galaxy. In this direction there are many fewer stars and clouds of dust to interfere with the view into the rest of the universe. And out in the universe there are as many galaxies as there are stars in our Milky Way. 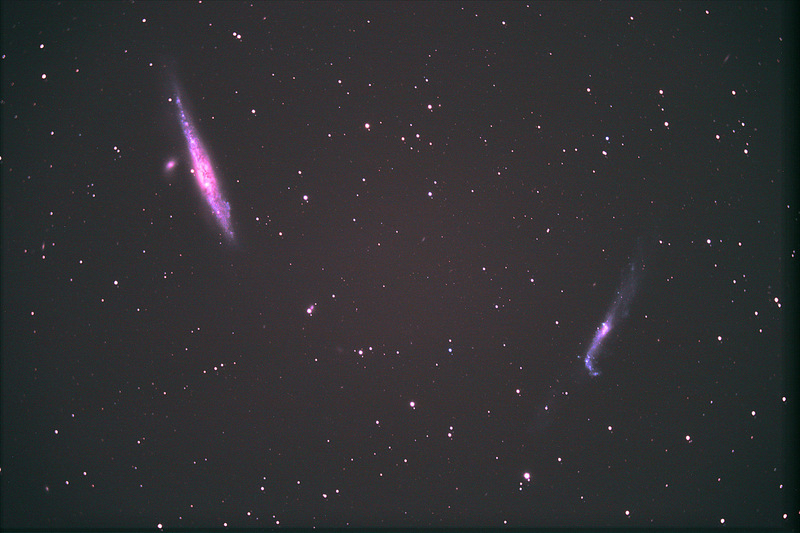 The Whale and Hockey Stick galaxies are nicknames for New General Catalogue (NGC) objects NGC 4627 and NGC 4656. They aren’t much to look at in this image taken with my vintage eight inch telescope. I can’t even see them through my two inch finder scope. I have to center the image by visually hopping the cross hairs from known star to known star and then wait to see if they show up in a digital photograph. But these are entire galaxies, seen edge on from about 25 million light years away. They lay nearby the queen’s hair in constellation Canes Venatici between Coma Berenices and Ursa Major (the big bear big dipper). The photons from these galaxies started on their way to the eight inch opening of my amateur telescope about 23 million years before humans appeared on Earth. The slightly distorted wedge shape of the large galaxy suggests a whale to some and thus the nickname. The Hockey stick is sometimes called the Crowbar Galaxy. Both are about the same size as the Milky Way. The Whale has a small companion elliptical galaxy nearby, NGC 4627. If you look closely at the blown up image you can see the ghosts of perhaps a dozen other tiny appearing galaxies. I wonder how many photons from these galaxies were captured on my digital camera’s sensor. Is it as many as there are stars in these galaxies or only a handful, the same few number as stars seen from the city? The technology of capturing photons from other galaxies digitally with amateur equipment is all the more amazing when considered in light of how brief a time we have even understood that there are other galaxies, that our own is not the entire universe. An Irishman, William Parsons, third Earl of Rose and master of Birr Castle in central Ireland, was the first to make out a dim pinwheel of light in Canes Venatici with his homemade telescope in 1845. His scope was a monster, made of iron hoops six feet in diameter. It was the world’s largest scope at the time and would remain so for three-quarters of a century. Making such a huge scope in the mid nineteenth century is one thing, but star gazing from Ireland’s soggy skies seems entirely another. Sir John Herschel speculated later these pinwheels might be “island universes.” But it was not until the construction of the telescope at Mount Wilson in California in 1923 that these fuzzy images were determined to be other galaxies. Not even 100 years ago and now any yahoo can snap a shot. My image was taken in one night after a previous night’s attempt was foiled by unexpected high, thin clouds. It is a total of two hours and 20 minutes of exposure made up of 28 five minute sub-frames (plus 12 dark frames, 12 flat frames and 5 bias). I was shooting for a total of three hours but was tripped up by the low tech links in the chain. A simple lamp timer I use to shut the guide mount down before it crashes the telescope into the tripod had issues and shut things down too soon. Higher tech, but still just an alarm clock, Siri on my iPad couldn’t be heard to wake me from a snooze on the couch while I waited for the exposures to complete because the operator had the volume off, so I didn’t get out in time to see that things had come to a halt. All the same, I am delighted to have this image.